These are about the most delicate size of this design that I can make. At around 1/2" in Diameter, they are neither tiny or large, but more in the medium dangle earring range. 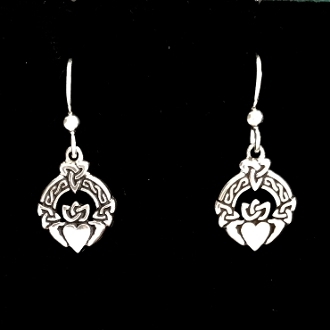 Easy to wear every day, these are one of my more popular original versions of the Claddagh image. This is another of our Original Versions of the Claddagh image which includes an expression of the many trinity concepts that exist in celtic culture. The classic "Friendship, Lolalty, and Love" is the well defined family value trinity concept of the Claddagh, yet historically, there are many important ideas in sets of 3. The most ancient is the "Triple Goddess" of Maiden, Mother, and Wise Women (See Description). In addtion there is "Life, Death, and Rebirth" as a classic fearless warrior triad, and the elemental expression of "Earth, Sea, and Sky." There are many other examples in celtic mythology and belief of animales, god/goddesses and others in sets of 3 aspects. It is with pride that we offer this personal yet symbolically historic example of our modernized and combined elements as one in this unique design expression.